From the beginning I knew I wanted this blog to look at the mechanics of Chrono Cross. It was my first JRPG, and changed my gaming taste forever. (It was not, I later realized, my first RPG – that turned out to be Steve Meretzky’s 1994 adventure game/RPG mashup Superhero League of Hoboken, though I couldn’t have put a name on either genre back then.) Thirteen years later, the clunky party management interface and Masato Kato’s storytelling excesses are more obvious, but back then I went in with essentially no expectations, and certainly no knowledge of Chrono Trigger to spoil the fun. Despite its flaws I find it holds up much better than Square’s PS1 Final Fantasies. And let me be the 1,000th person to tell you that Yasunori Mitsuda’s soundtrack is in a class above anything else in games. 1) Everything you do has multiple effects, which means no decision is as simple as it looks. Using an Element not only does whatever it says in the description but also adds the Element’s color to the Field Effect, calculated from the color of the last three Elements used, which modifies the effectiveness of all ally and enemy actions based on their innate color. If two of the last three Elements were red, blue characters are weakened, and vice versa. And in the rare case that the Field Effect is pure red, the red summon Element can be used, but since the colors of enemy Elements are also included, getting a pure Field Effect can be tricky. 2) Despite the complexity of the systems, the game teaches you a viable “default” strategy to fall back on. The maximum amount of stamina a character can have is 7. This is enough to perform a light attack (costs 1 stamina), a medium attack (2), and a heavy attack (3) before casting an Element, which can be performed so long as the meter is at least 1 (even though it costs 7). Because heavier melee attacks have a lower probability of hitting, but each successful hit increases that probability, the light-medium-heavy combo is an obvious progression that strikes a good risk/reward balance. And since Elements necessarily end your turn because of their high stamina cost, and require melee hits first, they make a natural combo finisher. By default, the interface will explicitly recommend this strategy, automatically advancing the cursor from 1 to 2 to 3 as long as you connect with each attack and bring the next attack level above an 80% chance of success. For most normal encounters, you don’t really need to deviate from this pattern, reducing the complexity of the decision tree to which party member attacks what enemy, and which Element to cast at the end. This strategy won’t suffice for tougher enemies and bosses – for instance, you might want to think about defending once in a while – and it can be rewarding to experiment with a fancier approach, jumping between party members that still have stamina and then unleashing multiple powerful Elements back-to-back. In fact, solving the “final boss puzzle” to get the good ending requires exactly this kind of stamina/Element coordination across your party. 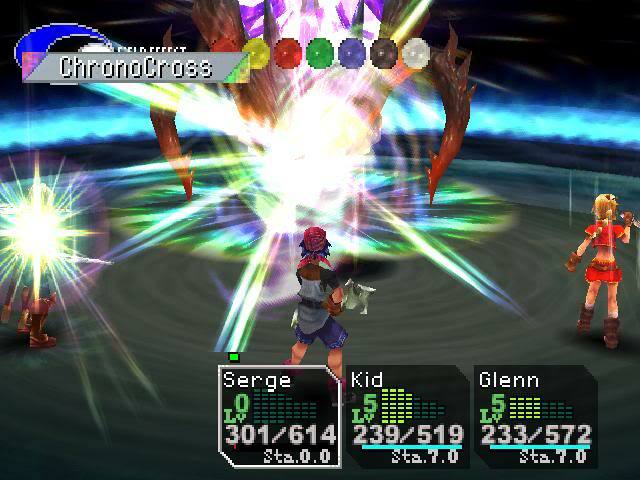 But by establishing the 1-2-3-element template early in the game, Chrono Cross gives the player a comfortable place from which to start exploring the depth of its systems. 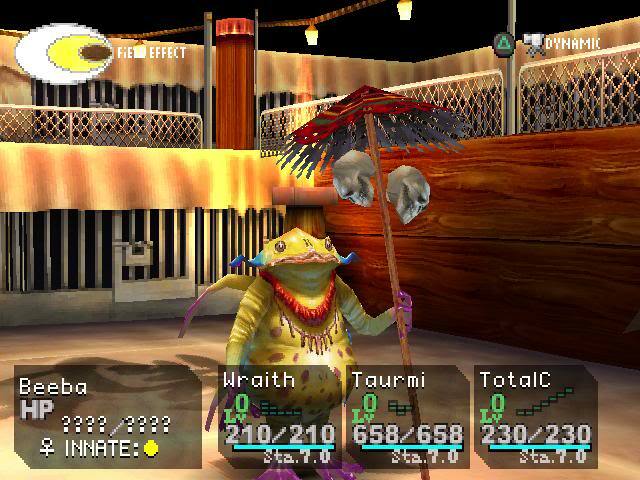 In terms of battle mechanics I only have one real quibble with Chrono Cross’ design, which is the lack of any indication of the enemy’s turn order. Until recently I wasn’t even aware there was a predictable pattern to enemy attacks (each enemy has a counter and after that many player actions they get a turn), but since it is predictable if you count manually, why not let the player see the number? If your answer is that it adds to the difficulty, please see my post on Active Time Battle for my opinion on adding difficulty through a gimped interface. 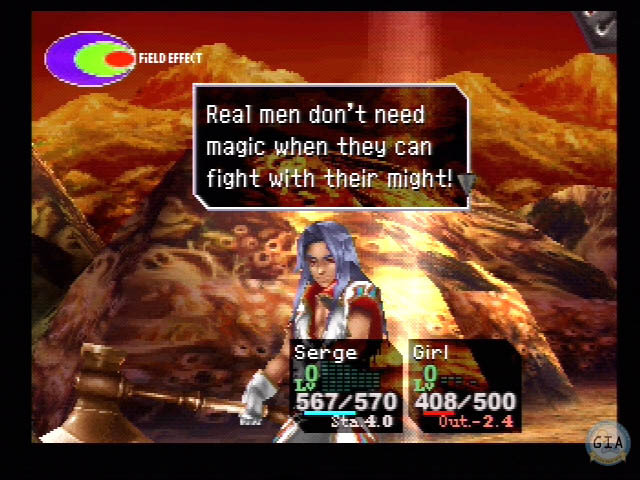 Still, it’s not nearly enough to taint the joy of playing the game, and if I were going to “fix” anything in Chrono Cross, it would be the miserable UI experience of moving a full loadout of Elements from one of your 4,000 party members to another.